WASHINGTON, May 19 (Xinhua) -- China and the United States issued a joint statement on Saturday on economic and trade consultations, vowing not to launch a trade war against each other. Based on the directions of Chinese President Xi Jinping and U.S. President Donald Trump, the Chinese and U.S. delegations conducted constructive consultations on trade issues on Thursday and Friday, the statement said. 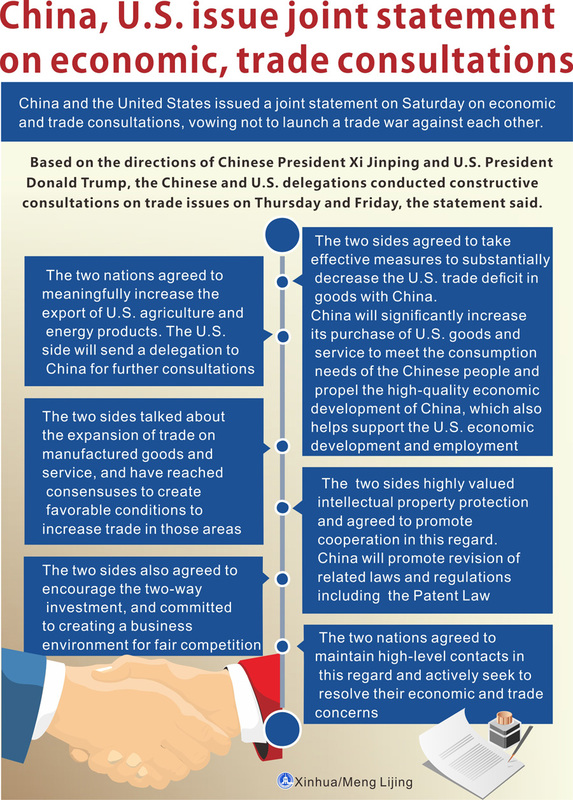 The two sides agreed to take effective measures to substantially decrease the U.S. trade deficit in goods with China. China will significantly increase its purchase of U.S. goods and service to meet the consumption needs of the Chinese people and propel the high-quality economic development of China, which also helps support the U.S. economic development and employment, according to the statement. The two nations agreed to meaningfully increase the export of U.S. agriculture and energy products. The U.S. side will send a delegation to China for further consultations. The two sides talked about the expansion of trade on manufactured goods and service, and have reached consensuses to create favorable conditions to increase trade in those areas. The statement said that the two sides highly valued intellectual property protection and agreed to promote cooperation in this regard. China will promote revision of related laws and regulations including the Patent Law, according to the statement. The two sides also agreed to encourage the two-way investment, and committed to creating a business environment for fair competition. The two nations agreed to maintain high-level contacts in this regard and actively seek to resolve their economic and trade concerns. The Chinese delegation was led by Xi's special envoy and Vice Premier Liu He, and the U.S. officials included Treasury Secretary Steven Mnuchin, Commerce Secretary Wilbur Ross and Trade Representative Robert Lighthizer. Liu arrived in Washington on Tuesday afternoon for economic and trade consultations with the U.S. side at the invitation of the U.S. government. Liu, also a member of the Political Bureau of the Communist Party of China Central Committee and chief of the Chinese side of the China-U.S. comprehensive economic dialogue, leads a delegation whose members come from major economic sectors of the Chinese government.